In June 2018, I was voted one of the winners of ‘I’m a Scientist’ – which is an online platform to engage school children in science where across a two-week period, I spoke to children of all ages about why people believe in conspiracy theories. On being voted a winner, I was awarded funding for public engagement activities. I am passionate about science communication where I regularly give public talks. 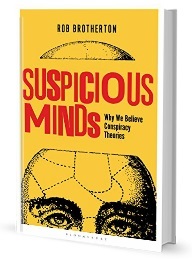 To try something different, I sought out artists from More than Minutes and gave them the task to draw what we know so far about the psychology of conspiracy theories. The artists listened to me give a lecture where I discussed what is a conspiracy theory, why do people believe in conspiracy theories and what is the potential harm; before they spent the afternoon drawing the research. I have turned the drawing into a video, where I provide a narration to bring to life the piece. You can find this on YouTube. With thanks to More than Minutes for drawing the research, alongside the support from I’m a Scientist and the British Psychological Society.